Crankcase ventilation systems are designed to prevent contaminating hydrocarbons from escaping to the atmosphere. This is accomplished by routing vapors from the crankcase through a vacuum-controlled ventilating valve (PCV Valve) into the intake manifold. In the intake manifold, the crankcase vapors mix with the air/fuel mixture and are burned in the combustion process. PCV systems are used on all 4.2L and 5.9L engines. 2.5L and 4.0L engines do not employ PCV systems, instead they are equipped with a Crankcase Ventilation System (CCV). The CCV system performs the same function as a conventional PCV system, but does not use a vacuum controlled valve. Air is supplied to the crankcase ventilation system through a crankcase ventilating filter assembly, located in air cleaner housing or on rocker arm cover. When engine is operating, fresh air enters crankcase ventilation system through the air cleaner and filter. Air then flows into the rocker arm cover and valve compartment. It combines with blow-by gas and unburned air/fuel mixture and burns in combustion chamber. See Fig. 1. When engine is started, manifold vacuum pulls valve open against spring pressure. As long as there is engine vacuum, the valve floats, permitting crankcase fumes to enter intake manifold. A baffle in rocker arm cover prevents oil from being drawn into intake manifold through ventilator valve. If the engine backfires, the ventilator valve will close. This will prevent ignition of fumes in crankcase. 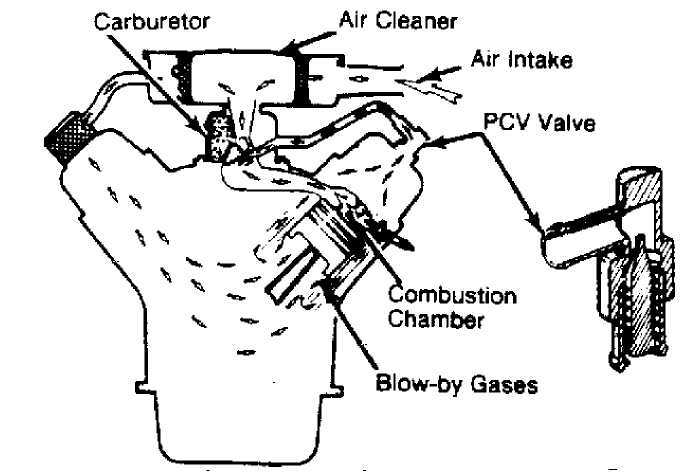 During certain engine operations, more blow-by is created than ventilator valve can handle. Excess blow-by is returned to air cleaner and carburetor through rocker arm cover and breather assembly. It is then burned in the combustion chamber. A breather assembly acts as separator to keep oil from being drawn into air cleaner during this operation. 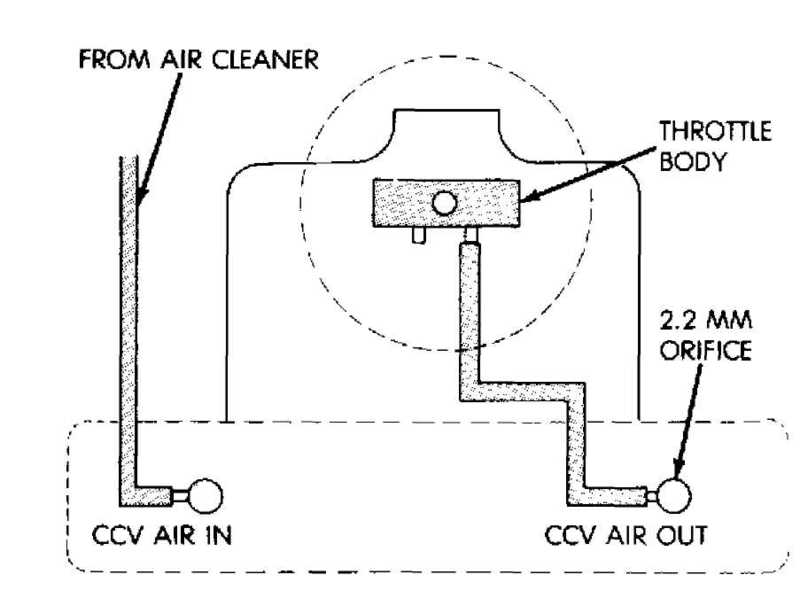 As stated above, the CCV system performs the same function as a conventional PCV system, but does not use a vacuum controlled valve. A molded vacuum tube connects manifold vacuum to a grommet on top of the cylinder head cover at the dash panel end. The grommet contains a metered orifice of a calibrated size that meters the amount of crankcase vapors drawn out of the engine. A fresh air supply hose from the air cleaner is also connected to the front of the cylinder head cover on 4.0L engines and to the rear of the cover on 2.5L engines. When the engine is operating, fresh air enters the engine and mixes with crankcase vapors. 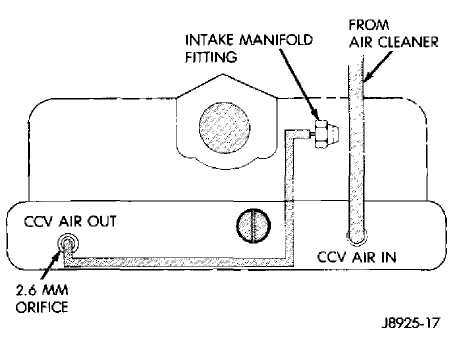 Manifold vacuum draws the vapor/air mixture through the metered orifice and into the intake manifold. The vapors are consumed during combustion. remove crankcase air inlet hose at air cleaner. be heard, indicating valve is free. does not pass on second try, clean system. Engine may idle slow or rough due to clogged ventilator valve or system. Therefore, never adjust carburetor idle without first checking valve and system. If ventilator valve or system becomes clogged, all crankcase ventilation will stop, and serious engine damage could result. Although following manufacturers’ service procedures give specific intervals, it is recommended the crankcase ventilation system be checked more frequently if vehicle is operated under severe conditions (extreme dust, prolonged idling, trailer hauling or short trips in cold weather). Replace PCV valve every 30,000 miles. Valve is located on rocker arm cover of 4-cylinder, 6-cylinder and V6 models and on intake manifold of V8 models. Clean filter element every 30,000 miles. Filter is located inside air cleaner of 4-cylinder, 6-cylinder and V6 models and in oil filler cap of V8 models.